Recently Dr. Yash Pal Lakra, EVFUSA was honoured for his work in Ekal Vidyalya Movement. Dr Lakra said that, “I think this honour is not for me but for Ekal Vidylaya, the largest NGO in the world working in literacy movement.” This event took place at Mr. Avinash Rachmale's house. 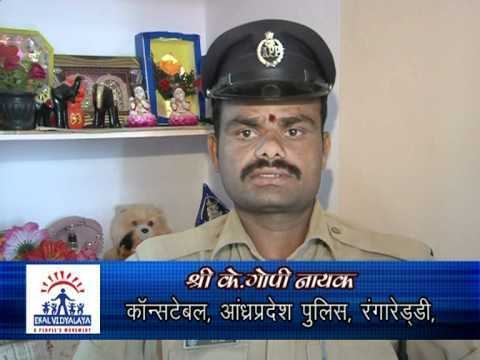 The person who honoured Dr. Lakra was Mr. Vishwanath Karad. He is the founder of Maharashtra Institute of Technology (a sprawling campus of 63 universities teaching app. 70,000 students) in Pune, India. He is also the UNESCO chair of Human Rights, Democracy, Peace and Tolerance for the World Peace Centre in Aladi, Pune, India. Unique Maritime Group which is one of the world's leading integrated turnkey subsea and offshore solution providers has recently joined hands with EKAL Vidyalaya as a part of its continued CSR initiative. 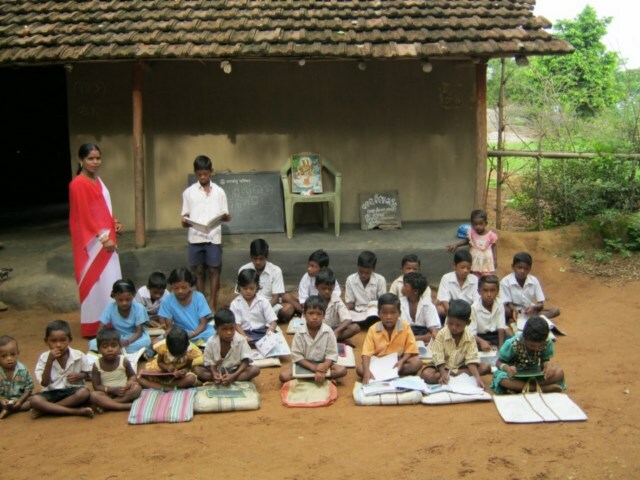 The scope of this project is to reach out to as many as unfortunate children across rural India who are unable to go to school due to financial or other reasons. UMG believes that every child has a right to education not just in the form of a functional literacy, but also a child's overall development and empowerment. The initiative to sponsor 50 schools per year over a period of 5 years is led by Harry Gandhi, CEO of UMG, who along with a team of like-minded individuals and the staff of Unique Maritime Group formed a group "Unique Friends Group" with an objective in mind "If the poor child cannot go to school, the school must go to the child" as stated by Swami Vivekanandji. On this occasion, Harry Gandhi, CEO, Unique Maritime Group asserted, "After the success of LaBL (Lighting a Billion Lives) initiative, we are overwhelmed to partner with an organization that aims at eradicating illiteracy in rural India. We are confident that by partnering with EKAL Vidyalaya, we can bring a smile on the face of millions of parents who under normal circumstances may not be able to send their children to school." 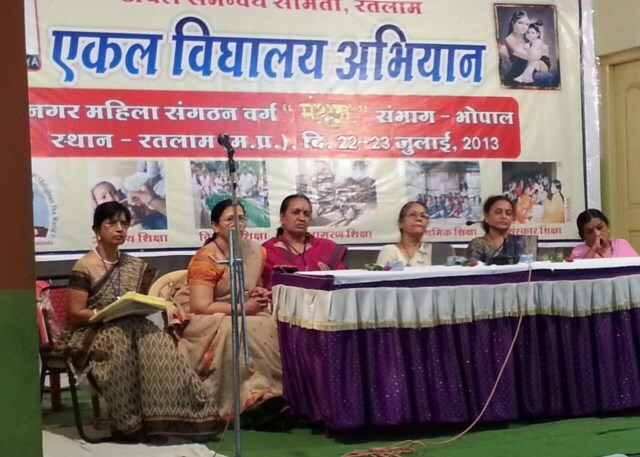 The 1st Mahila Varg of the year 2013 was held at Ratlam District Centre (Anchal Kendra) of Madhya Pradesh on 22nd & 23rd July 2013. In this two days workshop 152 Mahila Volunteers of Anchal Samities, Sankul & Sanch Samities from Madhya Bharat, Mahakaushal & Malwa Bhag centre participated. 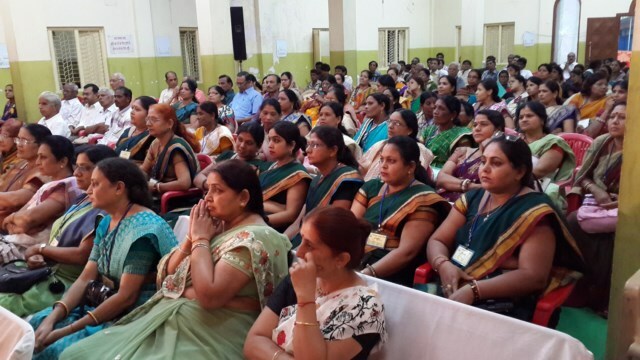 These Mahila Karyakartas are also the members of local co-ordinating committees of Ekal Movement. 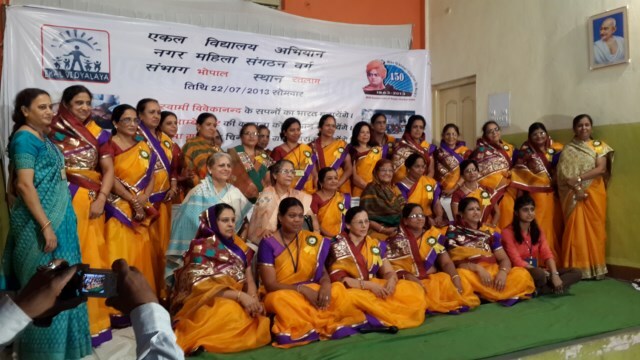 Out of 152 Mahila Karyakartas, 90 were from nearby Sanch Centres of Ekal Villages & 53 were from Anchal Centres. In Central Team, there were guests from Kolkata, Indore and Mumbai chapters. These are 14 Districts centres in the whole region out of which 10 centres represented in this training programme. It is highly appreciable and worth noting that all participants reached there from the most difficult & remote areas at their own expenses. Even some of them reached there by crossing forest & hilly routes to reach Ratlam and it was amazing to see no trace of fatigue on their faces. It is a matter of great pride that 90% of Mahila Karyakartas enjoys visiting their villages periodically by maintaining Sneh Sampark Parivar and performing their duties like a guardian and anyone can easily see the glow by ownership of “My Ekal School & my children”. Of course, they had some questions, doubts & face practical problems while discharging their duties. The same were discussed in open atmosphere and resolved. Prof. Manjushree whom they fondly call Manju Didi was there with Mahila Varg throughout the two days as their friend, Philosopher & guide. First, The quality concern of the Ekal Schools must be checked by Mahila Sneh Sampark Parivar periodically. Secondly, accelerating Abhibhavak scheme by Anchal Mahila Samiti to cultivate, nurture and motivate Karyakartas by giving them personal touch, thus enhancing their capabilities & performances. Besides above, during the sessions, the Samiti volunteers are being trained to cultivate donors by conducting Vanyatras (school visits). These women volunteers are also trained for checking all the activities of Ekal Schools. The inaugural function was graced by Sri Anokhilal Kataria noted businessman & social activist alongwith Mr. Shailendra Daga, Mayor of Ratlam city. We felt honoured ourselves by kind presence of Sri R.L. Kabra (Bapuji) and Smt. Kabra (Ma) from Mumbai in the Varg. Smt. Pushpa Mundra, President & Smt. 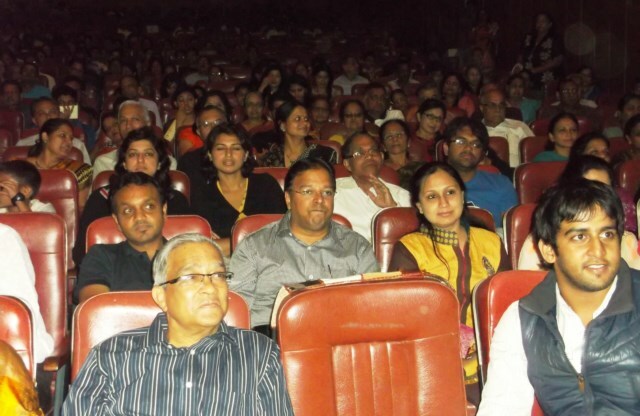 Geeta Mundra, Gen. Secretary of National Mahila Samiti, FTS were also present in the programme. The whole programme was wonderfully conducted by Ratlam Ekal Samity under the able guidance of Sri Govindjee Malpani, Sri Balkrishna Maheshwari along with Smt. Mangla Dave, Hemlata Malpani, Uma Rathi, Indira Daga and their strong team of Mahila Samiti. This reflects their organizational skills in carrying the Varg smoothly and successfully. On 21st July 2013, a press conference was organized, correspondents of almost all leading newspapers were present. The event got huge press coverage. In short, we may say that first Varg has boosted the morale and set a good precedence. 10th June 2013 is a day to be remembered and cherished for a long time. It was a day that brought to limelight to a fair sized gathering, a combination of shy but staunch philanthropists and the service goal of Ekal Vidyashram (Ekal SVO). A renowned industrialist Sri Vaidhyanathan, a shy philanthropist, reluctantly agreed upon insistence of his family members to celebrate his 60th birthday (Sashti Abdha Poorthi). He took this opportunity to be of service to humanity and adopted an innovative and generous gesture, of introducing his friends and relatives at this function to help Ekal Movement and donated the gifts received in the function to Ekal. In his invitation, he had made a specific request not to give gifts or money to him on the occasion, but if keen, they were requested to donate to Ekal. He invited Ekal Vidyashram (Ekal SVO), Chennai to participate in the function and accordingly Ekal team members participated and distributed the Ekal brochures to the invitees of the function. Many invitees showed interest to know more about Ekal and a detailed explanation of the objectives and roles Ekal is playing were explained to the guests. The relatives and friends of Sri Vaidyanathan ji liberally donated to the tune of Rs 1.35 lacs. These were the contributions of the good hearted people given on the occasion of Sri Vaidyanathan’s birthday. The function went off very well and thanks to Sri Vaidyanathan, Ekal not only received good amount of contributions but also was able to distribute the brochures to the guests and could explain personally to the guests the vision of Ekal. Some of the guests had even expressed a desire to follow what Sri Vaidyanathan ji did by making similar arrangements in their family functions. On behalf of Ekal Vidyashram, Chennai, we wish to place on record our sincere thanks to Shri Vaidyanathan ji and wish him a healthy and peaceful life ahead. 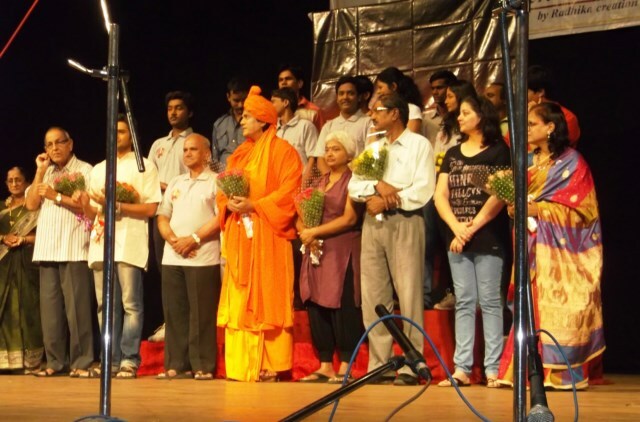 Mahila Sammittee Members of FTS Bangalore celebrated 150th birth anniversary of Swami Vivekananda by organizing a Play on Swami ji on 05th July, 2013 at the prestigious Chowdaiah Memorial Hall, Bangalore. Well known dance troupe Radhika Creations from Indore was invited to stage the play. To commemorate Silver Jubilee year of Friends of Tribals Society, children from local schools were invited and were accorded special preference. The program was a thundering success. The dedication and hard work put in by the Mahila Members of Bangalore Chapter is worth appreciating. Friends of Tribals Society, Indore is organizing many programmes as the silver year celebration of Ekal Movement. 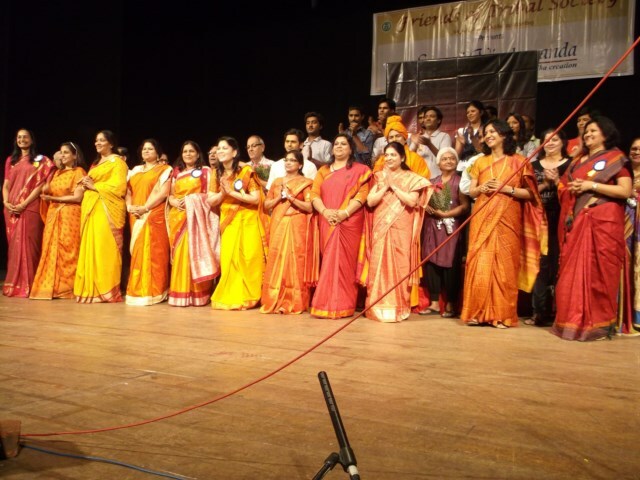 In this series Indore chapter organized a grand programme “Asha Bhosle Night” titled “Vo Subah Kabhi to Aayegi” at Taxshila Auditorium, Indore on July 20, 2013. Around 1000 people of the city participated. 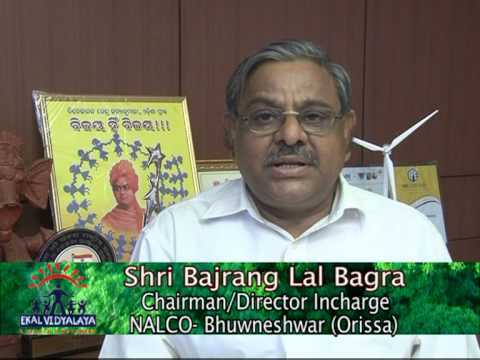 Sri Rameshwar Lal Kabra (Patron, FTS), Sri Mangi Lal Jain (Ekal Abhiyan Prabhari), Pof. Manjushree (National Organizing Secretary), FTS, Smt Pushpa Mundra (National President, FTS Mahila Samiti) & Sri Madhavendra Singh (Yojana Pramuk, Ekal Abhiyan) graced the occasion. Sri Shiv Kumar Chaudhary, President and Sri Om Prakash Dhoot, Secretary, FTS Indore welcomed the guests. Sri Shyam Gupt (Sangathan Prabhari, Ekal Abhiyan) also graced the occasion and addressed the participant from the dais. 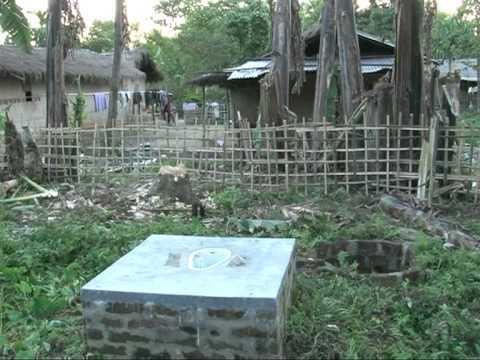 He appealed the people to join and contribute to Friends of Tribals Society. Singer Sangita Melekar from Mumbai mesmerized the audience with melodious songs of Asha Bhonsle. She was accompanied by co-singers Prashant, Shifa Ansari and Vikrant Bhavsar. The house was overwhelmed by her performance. A contribution for 96 schools was announced by the supporters in the programme. 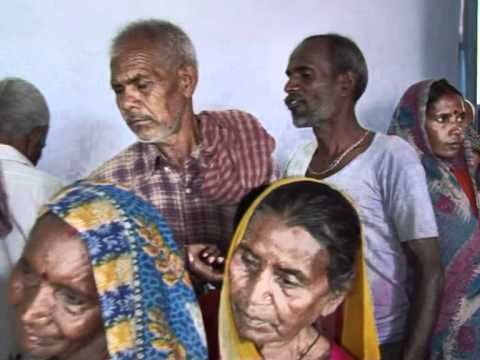 On the fine morning of 8th June, I had the opportunity of taking Smt Sukshamji and her family members for a Vanyatra to a village Sayapur near Mathura. Starting at 9 AM from Delhi, we reached Mathura by 12 PM in the noon. Sri Ramesh Gupta, Samiti Pramukh was kind enough to receive us at Mathura. After a tasty real traditional Indian lunch served by Rameshji’s family, we started for Sayapur by 2:30 PM reaching Sayapur by 3 PM, the time for the Vidyalaya to start. N R I donor and the acompanying team was warmly received by the village ladies by applying Tilak and garlanding the team members. The class started with recitation of Sarasvati Vandana-He Hansvahini Gyandayini Ambe Vimalmati de. Then children recited poems and patriotic songs in Hindi and local dialect. They recited tables also. Smt. Sukshamji and family members interacted with the children and asked them what they would like to be in life. She interacted with the village elders also. She appreciated the simple life style of the villagers. She distributed note books, pencil boxes and chocolates to all the children. Despite hot sunny day she stayed there for more than an hour. We started our return journey after 4 PM. On our way back we visited Krishan Janam Bhoomi and the surrounding temple complex. Smt. Sukshamji and family had a unique experience witnessing working of Ekal Vidyalayas. She promised that she will support our cause as she has been doing in the past years. We reached Delhi by nine.